Okay, to be perfectly honest, I'm HALF Irish. Yup... my family came to Canada hundreds of years ago. Both my mother's and father's ancestors were half Irish and half English. (My mother's ancestry has been traced back to Drogheda, Ireland (familiar to anyone who has read or watched The Thorn Birds), father's English side back to Nottingham, England). Therefore, according to my limited mathmatical skills, that still makes me half Irish. So I take St. Patrick's Day ver, ver seriously. I vaguely know that St. Patrick rid Ireland of snakes. And, er. Leprechauns have pots of gold they guard with their lives (thank you Bugs Bunny). And shamrocks and four leaf clovers are good luck. 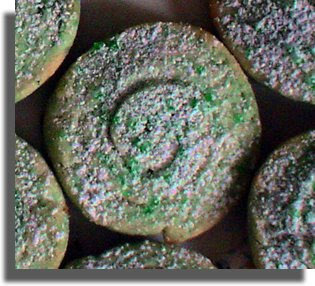 But the most important thing about today is that I get to wear green, make a huge pot of Irish Stew and dive into those green lime cookies I baked yesterday. My ancestors -- Gosh and Begora, they'd be proud. Good ole' bugs, he's so educational. The bank in the town where I went to high school used to have out green bagels. The cookies look better! So....if I take a snake back to Ireland, will it automatically die when I step off the plane, or just have an uncontrollable urge to slither into the sea? I celebrate ALL holidays that involve food. Hey, I'll be having a pint tonight and I'm not even Irish! I'm just very supportive. I enjoyed chasing you all over the blogsphere yesterday. I was pretty much one hoppin' comment behind you the whole night. Mmmmm...soda bread and green beer await me. What's not to like about a holiday like that? 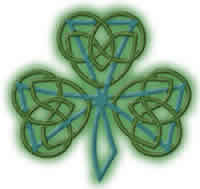 I have no Irish blood in me at all, so my brother, the geneology expert for my mother's side tells me! I had always thought I was 1/4 Irish, but I recently found out that quarter is Scottish! Oh well! I've never really been into St. Paddy's Day since I don't drink, and what else is there to do? ;-) Mrs. Phoenix, on the other hand, is a 100%, true green Irish colleen (no, not her name) born in Northern Ireland. And even SHE didn't wear green today! LOL! So that makes my kids 1/2 Irish, which they were quite proud to proclaim today. Hope your day is filled with green and fun! I am all Dutch, of course, but my daughter is part Irish through her paternal great grandmother, whose name was Irene something or other, I have forgotten. So my daughter can celebrate her Irish roots, which I am sure she has done this weekend. Lotus07: Snake on a Plane??? Didn't you see that movie? You can't do that without Sam Jackson there to protect you. OhMommy: I love all holidays too... after all, what are holidays without all the special food? Not much of a holiday at all. Jeff: Was your pint tinted green? Har! About the Blog Hoppin'... I can never visit the whole list in one night; there are way too many. Momo Fali: I don't think I've ever tried soda bread.... I'll have to try one day. VE: "Irish you a happy St. Patricks day"... Hah! That's a great one! From one Iriah girl to another HAPPY ST. PATTY'S DAY!!! It's awesome you can trace your family history so far back...very cool! Huckdoll: My parents were on a mission in the 80's when they first retired to trace back our family tree as far as they could. They travelled, researched and made books of both sides of the family for all three of their kids to pass on the information. One side has been traced back to 1555! It really is amazing to read the stories, and makes them extra special when you know that they are now a part of you... and your children.